Colby Lewis picked up his first win of the year with six innings of one-run ball and Rougned Odor tallied a trio of RBIs as Texas topped the Mariners, 7-3, in Monday's series opener at Safeco Field. Nelson Cruz matched Odor with three RBIs as he cranked his second homer of the season as well as a run-scoring double, but that was all the scoring the Mariners could muster in their fourth straight loss. Lewis allowed just four hits with a walk and six strikeouts as the veteran right-hander retired 13 straight batters after giving up his lone run in the first. Odor ripped an RBI double in the fourth and a two-run single in the eighth as the Rangers racked up 14 hits. "It looked like he was just barely missing off the edges in the first inning," Rangers manager Jeff Banister said. "The pitch count got up on him a little bit in the first but he was able to limit the damage. Once he finds his range and his release point, he's always tough." Mariners right-hander Hisashi Iwakuma took the loss as he gave up three runs on eight hits in six frames. Iwakuma had gone 6-0 with a 2.87 ERA in his previous eight starts against the Rangers dating back to 2013. The Mariners fell to 2-5 and have lost their first four home games for the first time since 1992, while Texas evened its record at 4-4. "Nellie obviously drove in all our runs tonight and he's looking much more comfortable at the plate than he was early on," Mariners manager Scott Servais said. "But we struggled to put consistent, quality at-bats together. It just isn't happening right now and what are you going to do? We just need to keep battling and fight through it and eventually we'll come out of it." "That's a situation where we have to get better," Robinson Cano said after the rest of the club went 1-for-6 with runners on second or third. "We're not going to win games scoring one run. You have to take advantage earlier, especially when you're playing in your division. We've got to get better with men in scoring position." Fielder keeps driving in runs: Prince Fielder is hitting just .214 but has nine RBIs in the Rangers' first eight games, including two more on Monday night. He had a sacrifice fly in the third inning and a two-out RBI single in the seventh off of left-hander Mike Montgomery. That came with runners at the corners after Adrian Beltre was walked intentionally. "That's my job to produce runs," Fielder said. "I'm locked in with those situations. It's when there is nobody on base when I tend to drift off to la-la land." Mazara stays hot: Nomar Mazara, playing in his second Major League game, had two singles in his first two at-bats and a sacrifice fly in the Rangers' three-run eighth inning. He is the fifth Ranger to have at least two hits in his first two big league games. Mazara has a total of five. Rusty Greer is the only Rangers player with at least five hits in his first two games. "Mazara definitely has a gold star next to his name on the lineup card," Banister said. 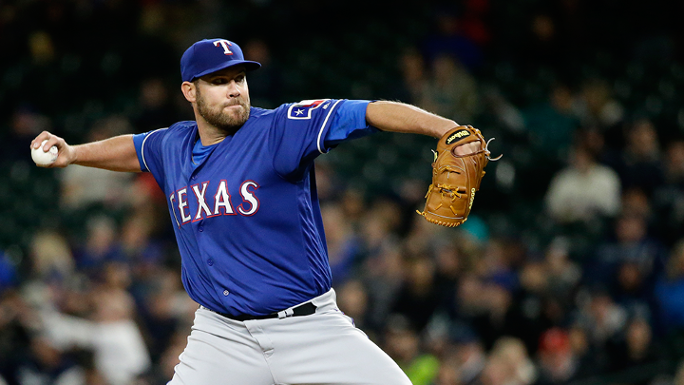 Not this time: The Mariners jumped on the Rangers bullpen for a couple of late-inning rallies in the season-opening series in Arlington, but they couldn't deliver the big hit when the game was still close after Lewis left with a 4-1 lead. Seattle loaded the bases in the seventh whenFranklin Gutierrez singled and Chris Iannetta was walked by Andrew Faulkner. Leonys Martin then reached on an infield single against Sam Dyson, but the Rangers right-hander escaped that jam when Norichika Aoki hit a hard grounder right at first baseman Mitch Moreland for the third out. "We had Dyson out there and bases loaded and Aoki hit the ball OK down the line," Servais said. "They make a play, that happens. It's the big leagues. But we need a little good fortune to turn our way. We have to keep battling and make it happen. Nobody is going to give it to us. We have to be a little more aggressive and play with a little more edge. We'll see how that comes about tomorrow night." After ripping four home runs and seven RBIs in three games to open the season in Texas, Cano is 2-for-16 with no RBIs or runs scored in his first four games of the season at Safeco Field, as his average fell to .207. Rangers: Left-hander Derek Holland pitches for the Rangers against the Mariners at 9:10 p.m. CT Tuesday at Safeco Field. Holland, who has more wins against Seattle than any other team, is trying for his first win at Safeco since 2013. Mariners: Wade Miley makes his first career start at Safeco Field in the middle game of the three-game set at 7:10 p.m. PT. The 29-year-old lefty took a no-decision at Texas last Saturday, allowing five runs and seven hits in six innings in a game the Mariners rallied late for a 9-5 win.